Hubby and I visited a couple of sightseeing spots during Obon Holidays in mid August, Tokyo Skytree Tower in Tokyo being one of them. 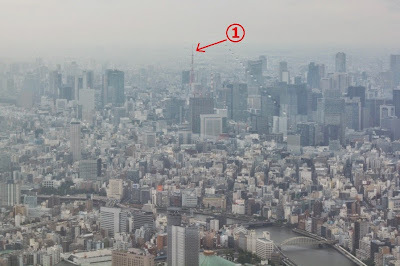 We had earlier visited Tokyo Skytree Tower in December 2010, at which time it was being constructed. Also in May 2013, while driving through Tokyo area we got a wonderful view of the majestic tower. 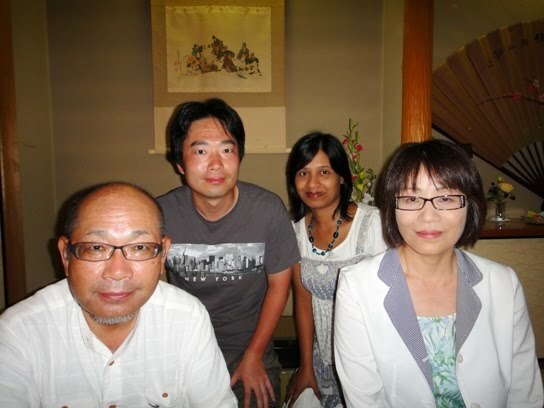 At that time we had decided that we would visit the tower during our next trip to Tokyo area. 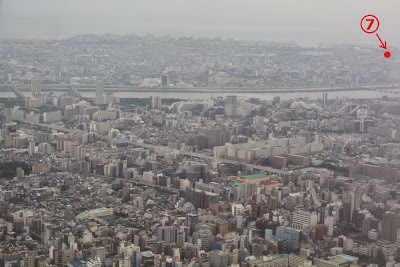 As I have stated in a September blog post, we had some work in Tokyo area on 11th August, so we stayed in Tokyo area for one more day and visited Tokyo Skytree Tower on 12th August. I will write about our visit to the tower in this post. Tokyo Skytree is a broadcasting, restaurant, and observation tower located in Sumida ward of Tokyo. It has a height of 634 meters, and is the world’s highest stand-alone communication tower. It is also the second tallest structure in the world. 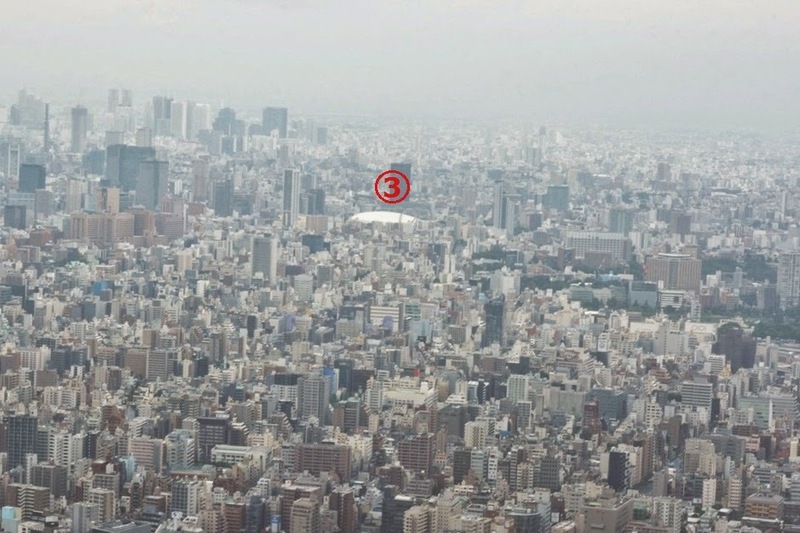 The height of the tower is derived from Musashi, which is a historic name of the Tokyo region. The phonetic pronunciation of the word Musashi can be divided into three parts ‘Mu’, ‘Sa’, and ‘Shi’, which mean ‘six’, ‘three’, and ‘four’ respectively; and hence the height of 634 meters. Actually the roof of the tower has a height of 495 meters and the antenna spire reaches a height of 634 meters. The tower has two observatories; the one located at 350 meters is called Tembo Deck and the other located at 450 meters is called Tembo Galleria. 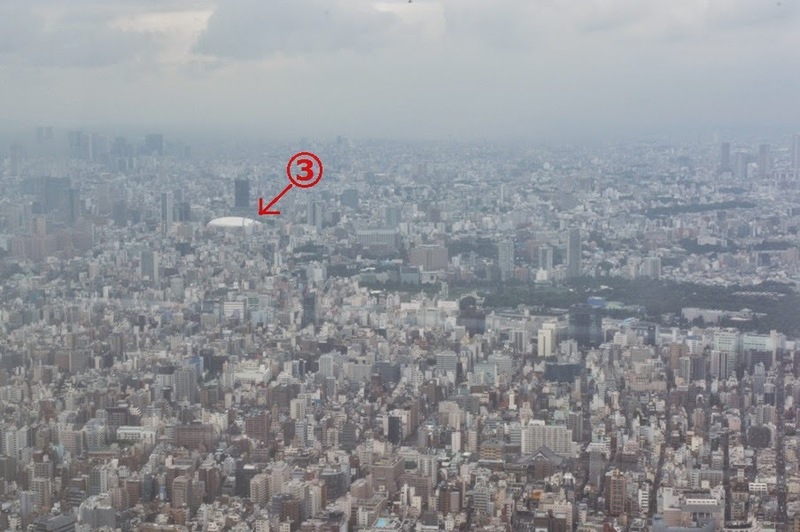 These observatories are the highest observation decks in Japan. 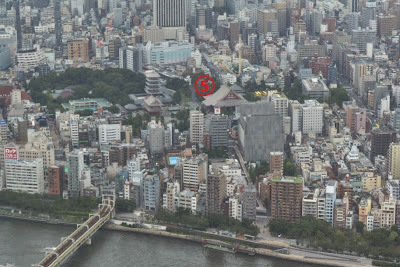 The tower is the primary television and radio broadcast site for the Kanto region, and transmits radio waves for digital terrestrial and other forms of broadcasting. Transmission from such a tall tower is unlikely (or less) to be influenced by the numerous surrounding high-rise buildings. 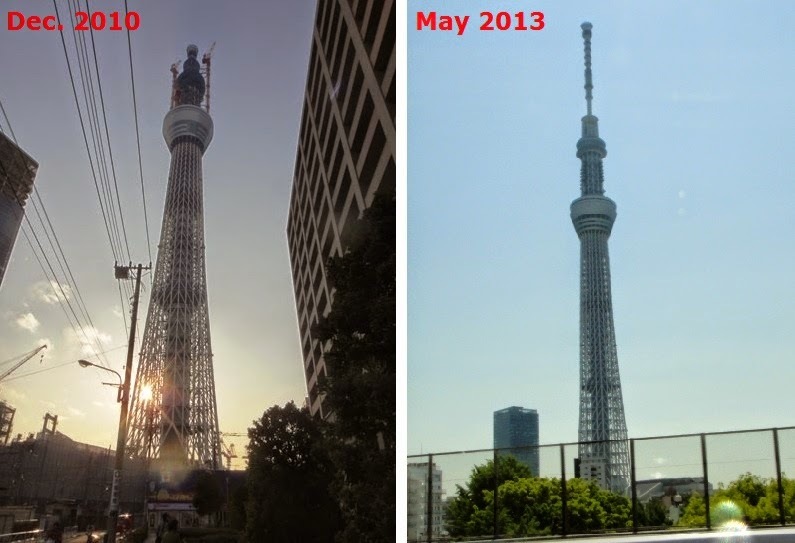 The construction of Tokyo Skytree Tower was started in July 2008, completed in February 2012, and opened in May 2012. 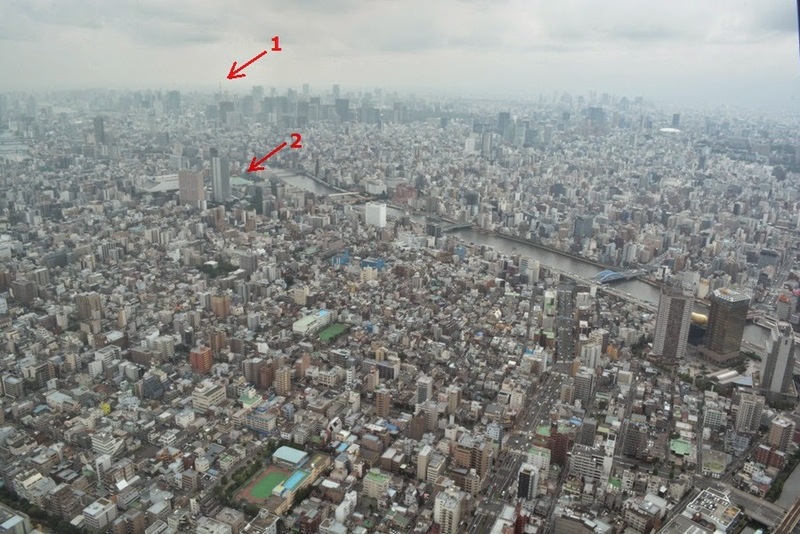 The tower has already become a major symbol of Tokyo, forming the centerpiece of Tokyo Skytree Town in Sumida ward, which also encompasses a building named Tokyo Skytree East Tower, a complex of shops and restaurants called Tokyo Solamachi, as well as an aquarium and a planetarium. Tokyo Skytree Tower is a combination of hi-tech forefront technologies and traditional techniques. It is a perfect fusion of neo-futuristic design and traditional beauty. The tower stands on an equilateral triangle cross-section, and as it progresses upwards, it gradually changes to circular cross-section. The circular upper structure fends off forces of winds from any direction. The tower also features forms that incorporate techniques such as the concave Sori curves used in traditional Japanese architecture and the convex Mukuri curves found in temple architecture. In addition, the tower features ‘Shinbashira Seishin’ vibration control system, which is inspired from the traditional five-storied temple pagoda Gojunoto. 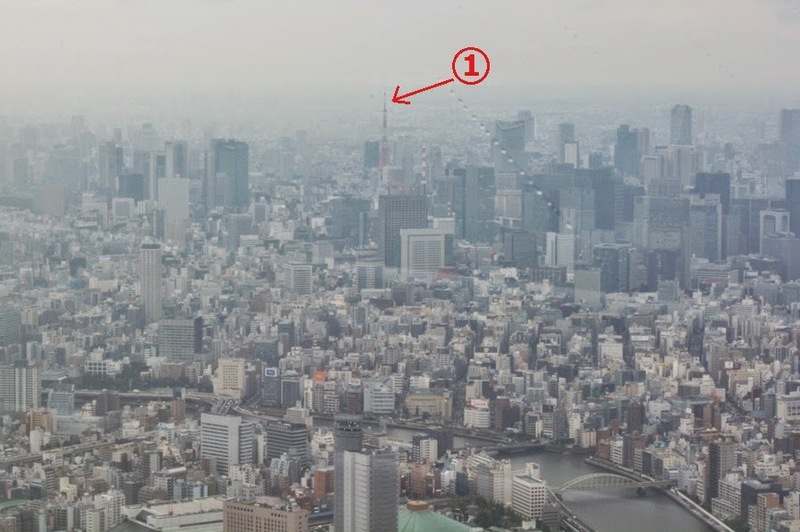 A 375-meters tall reinforced concrete pillar in the central core of Skytree Tower and the steel-frame tower body that surround the pillar move separately to absorb up to about 50% of the seismic quake vibrations and swaying during high winds. The tower is colored in ‘Skytree-white’ which is an original color derived from the traditional color Aijiro (indigo-white). The faint bluish white on the tower has the luster of white porcelain. On the morning of 12th August, hubby and I visited Tokyo Skytree Tower. The previous night, we had stayed at a hotel near Haneda Airport. 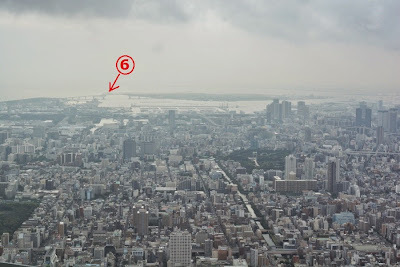 We left the hotel at about 9 am, changed trains a few times, and reached Tokyo Skytree Railway Station at about 10 am. From the railway station, we walked for about 5 minutes and reached the front entrance area of Tokyo Skytree Tower located at the first floor. We soon realized that this entrance at the first floor was only for people who had purchased admission tickets with advanced reservations. We had to purchase walk-up day-tickets. Since it was a holiday season, there were too many visitors that day. So near the front entrance area, the staff distributed numbered cards with time slots to come back later and use for purchasing the actual tickets. Our slot was between 12.30 pm and 1 pm. We still had about two hours, so we explored the area and the shopping center. We clicked a few photos of the tower and the surroundings from near the east-northeast front entrance area of the tower. Next we walked along the base of the tower towards the west, and again clicked a few photos of the west-northwest side of the tower. 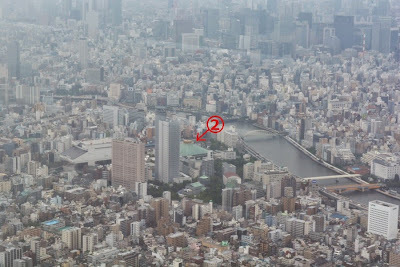 We were too near the tower, and we clicked the photos from right below the tower. So it was difficult to view the antenna spire properly. We spent about ten minutes enjoying the magnificent architecture of the tower. Afterwards, we walked back along the base of the tower towards the east and continued walking eastwards for a couple of minutes. 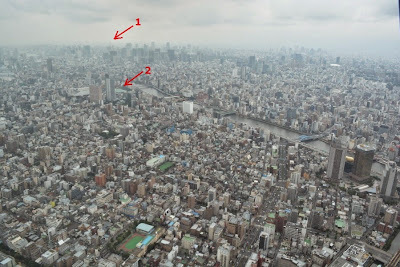 Soon we reached near East Tower building and the shopping complex Solamachi from where we again got a wonderful view of the east-northeast side of Tokyo Skytree Tower. But now we were rather far from the tower, and so we could very clearly see the two observatories and the antenna spire of the tower. 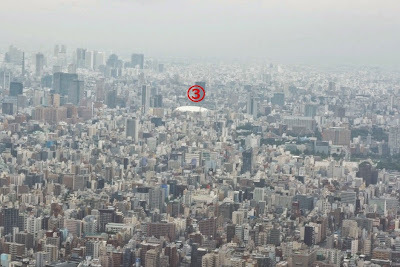 Next, we went to Tokyo Solamachi located at the base of Tokyo Skytree Tower. Tokyo Solamachi is a large shopping, dining and entertainment complex that features over 300 shops, many restaurants, a planetarium, and an aquarium. We did a lot of window shopping. 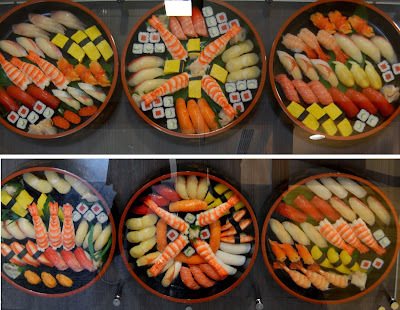 I loved a shop selling plastic food samples. 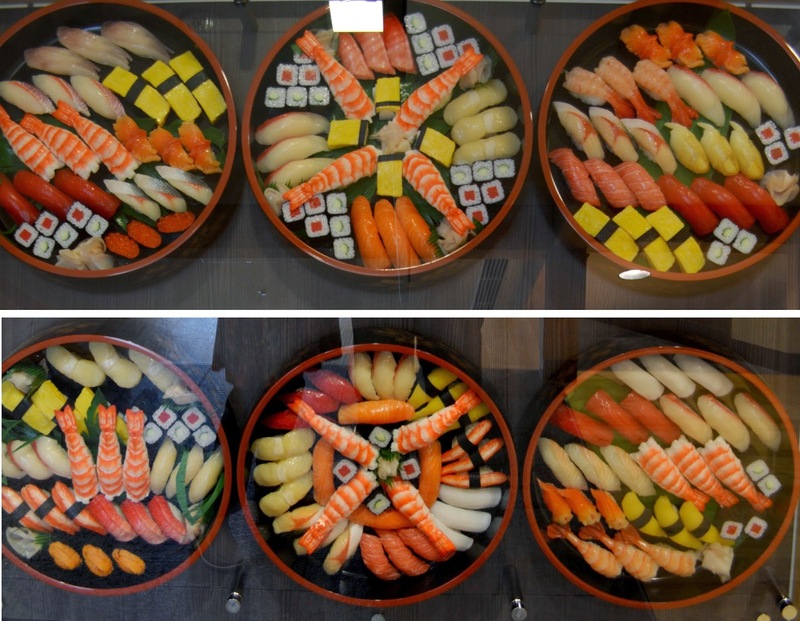 A panel displaying many toast samples with various toppings and another panel displaying various kinds of Sushi samples in round Bento boxes were amazing. They looked so real. Next, we went to a souvenir shop and bought a few packets of traditional sweets and cookies as souvenirs for our relatives. Afterwards we had lunch at a restaurant in the complex. 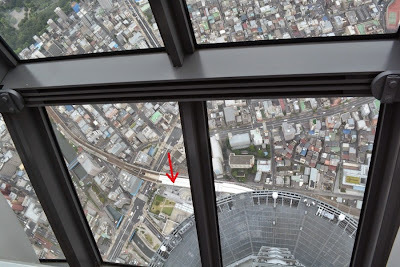 At about 12.30 pm, we returned back to the entrance area of Tokyo Skytree Tower. The tower has the first, the fourth, and the fifth floors as the lower floors. 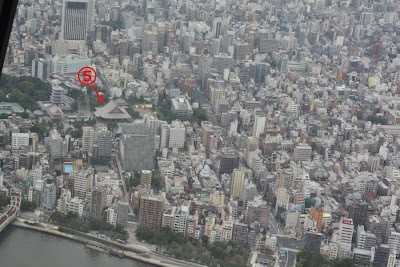 As I mentioned earlier, the first floor entrance to the tower is only for people who have purchased admission tickets with advanced reservations. We had to buy walk-up day-tickets at the ticket counters located at the fourth floor. So we took an escalator up to the fourth floor entrance area, and our visit inside the tower started from this floor. Since it was a holiday season, there was a big queue of visitors in front of us waiting for their turn to buy the tickets. After about 45 minutes of waiting we could buy tickets worth 2060 Yen per person as admission fee for the first observatory Tembo Deck. While waiting in the queue, we saw a 22-meter wide wall art named Super Craft Tree. It exhibits twelve works of art handcrafted with Edo Kiriko cut glass, Kumiko latticework, and other traditional materials and techniques incorporating the culture of Tokyo Shitamachi. After purchasing the tickets, we walked up to the front of the elevators located at the fourth floor. These elevators called Tembo Shuttles transport visitors to Tembo Deck Observatory of the tower. In front of the shuttles, there was again a big queue and we had to wait for about 15 minutes for our turn to enter the shuttle. There are four lines of Tembo Shuttles having different decoration featuring spring, summer, fall, and winter, respectively. The one we entered had the decoration of spring cherry blossom sky. The other three shuttles have summer Sumida River sky, fall festival sky, and winter sky of hooded gulls. The ambience inside the shuttle was very nice and special. In fact, these Tembo Shuttles are Japan’s fastest 40-passenger elevators and reaches a top speed of 600 meters per minute. We had a fast and very smooth ride, and were transported to the top floor of Tembo Deck Observatory in about 50 seconds. The highlight of Tokyo Skytree Tower is its two enclosed observatories which offer spectacular views of Tokyo and its surroundings. After the Tembo Shuttle ride, we reached Tembo Deck Observatory located at 350 meters above ground. Tembo Deck has a capacity of up to 2000 people, and spans three levels with great views from all of its floors. 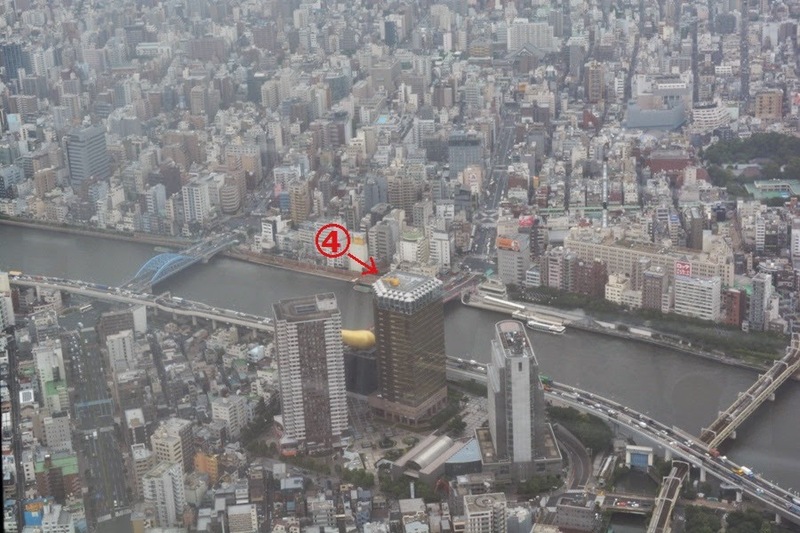 The top floor is located at 350 meters above ground level and features tall, broad windows that offer a 360-degree panoramic view of the entire Kanto region. 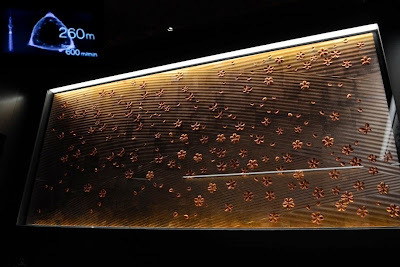 This floor has three 52-inch Tokyo space-time navigation monitors connected at the sides and display breathtaking panoramas of the Tokyo landscape from the deck along with guidance on a touch-panel display. This floor also has a cafe that serves original drinks and softcreams in a standing-only setting. The middle floor is located at 345 meters above ground level and has a restaurant named Musashi Sky Restaurant, which serves Tokyo cuisine having a variety of ingredients and traditional Edo vegetables. The lowest floor is located at 340 meters above ground level and features a glass panel flooring on the ground from where visitors can look all the way down to the base of the tower. This floor has a cafe where tables are available for relaxing and enjoying snacks. After the Tembo Shuttle ride we reached the southern side of the top floor of Tembo Deck Observatory. 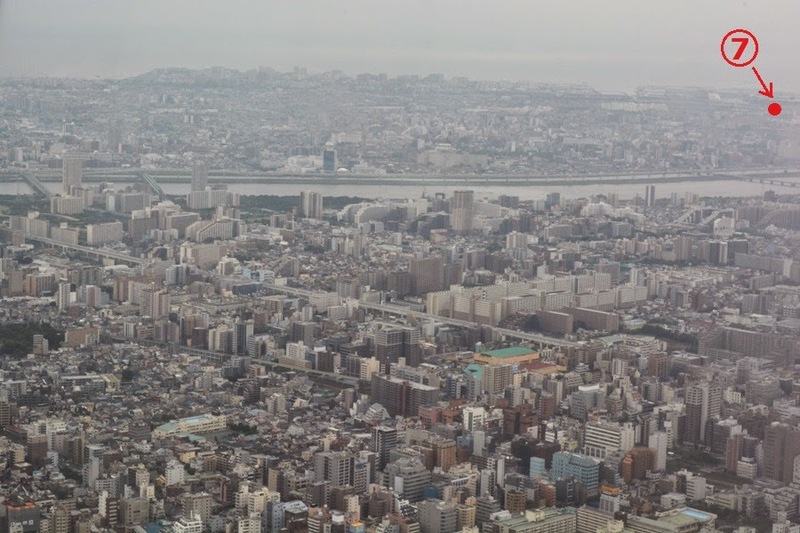 First, we just walked around the deck and enjoyed the wonderful panoramic views of Kanto region, especially Tokyo and its surroundings, from the large glass panes. 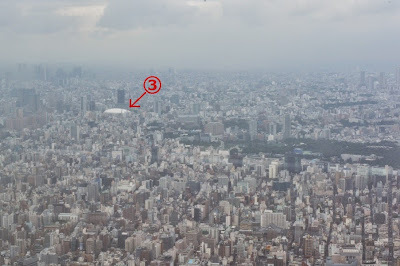 Next, we clicked several photos of the panoramic views starting from the east, and proceeding in a clockwise direction. We saw several important and historically significant structures that I have pointed out and numbered here. 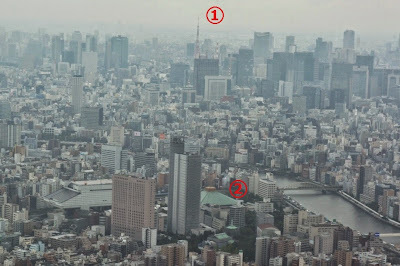 Number 1 is Tokyo Tower, number 2 is Ryogoku Kokugikan Sumo Stadium, number 3 is Tokyo Dome, number 4 is Asahi Beer Tower, Super Dry Hall, and Asahi Flame, and number 5 is Sensoji Temple. 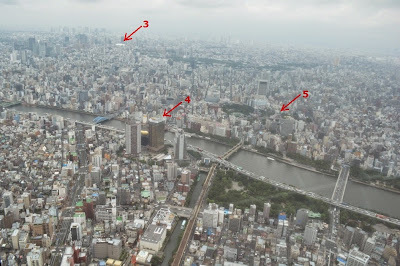 In addition, Sumida River flowing into Tokyo Bay is so prominently seen. The 360-degree panoramic view of the entire Kanto region allowed us to see many other significant structures and buildings. It was an amazing experience. Next, we took an escalator down to the lowest floor of Tembo Deck Observatory. 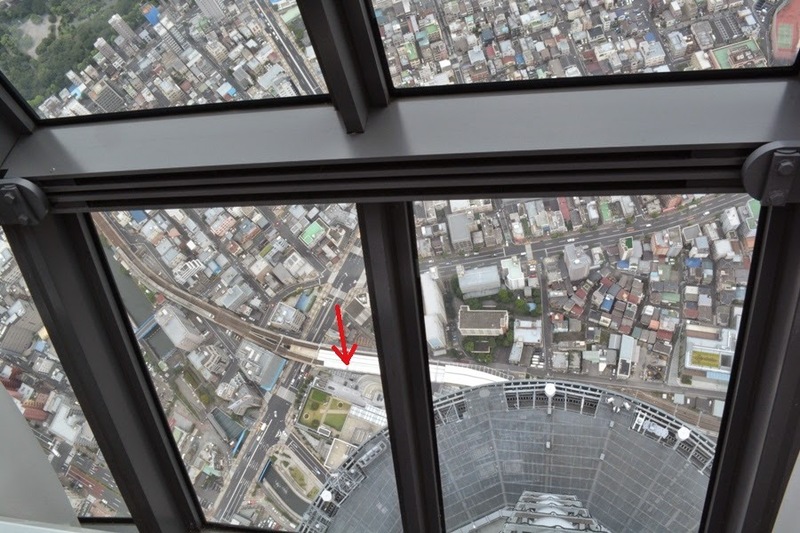 This floor, located at 340 meters above ground level, has a provision to have the souvenir picture of visitors taken professionally with the panoramic view of the southeast side of the city in the background. We had our picture taken and it came out rather well. 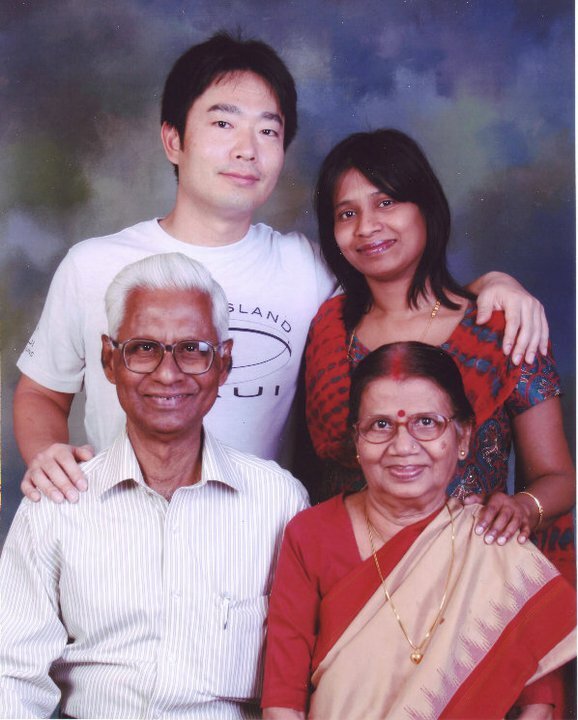 We paid 1200 Yen for the printed version of the souvenir picture. This floor also features heatproof tempered glass panel flooring from where we can look all the way down to the base of the tower. We stepped onto the glass floor but it was a bit scary to get a direct downward view of the streets below. Here also we had a souvenir picture of us taken professionally with the steel framing of the tower and the streets below us visible. 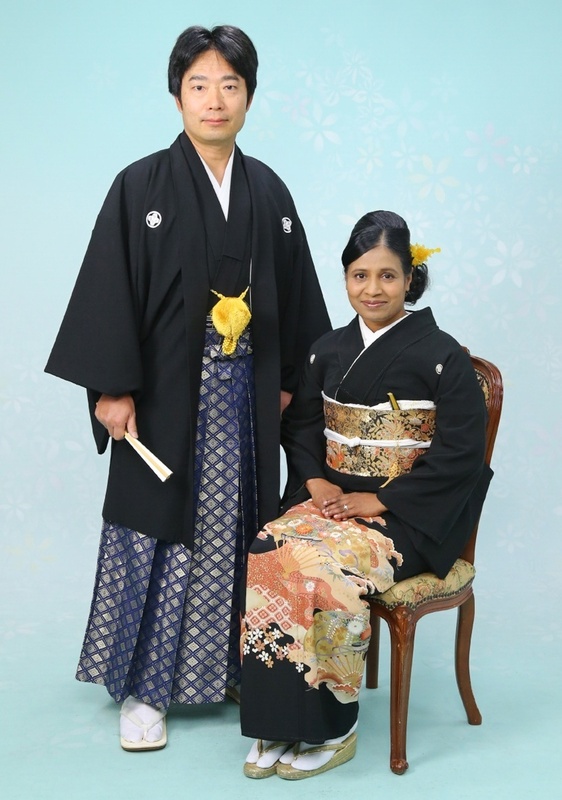 The printed version of this souvenir picture also cost 1200 Yen. Afterwards we went up an escalator which took us back to the top floor (350 meters) of Tembo Deck Observatory. At a ticket counter located on this floor, we bought tickets worth 1030 Yen per person as admission fee for the second observatory Tembo Galleria. Tickets for Tembo Galleria Observatory can be purchased on the same day only as advanced reservation of tickets is not possible. After purchasing the tickets, we walked up to the front of Tembo Shuttle elevators located towards the northern side of this floor of the Tembo Deck. These shuttles connect the top floor of Tembo Deck Observatory to the lower floor (445 meters) of Tembo Galleria Observatory of the tower. There are two lines of these shuttle elevators and they have see-through front panel and ceiling. There was hardly any queue in front of the shuttles, and we could enter the shuttle just after two minutes of waiting. We had a fast and smooth ride, and enjoyed viewing the metal framing of the tower seen through the see-through ceiling. We were transported to the lower floor of Tembo Galleria Observatory in about 15 seconds. 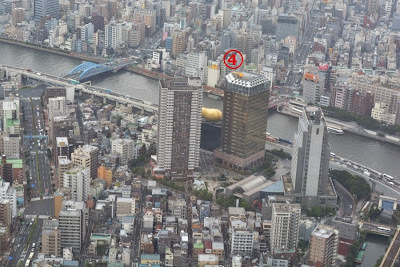 As discussed earlier, Tembo Galleria Observatory is the upper observatory of Tokyo Skytree Tower. This observatory has a capacity of up to 900 people, spans two levels, and is called ‘the world's highest skywalk’. After the Tembo Shuttle ride, we reached the lower floor of Tembo Galleria Observatory located at 445 meters above ground level. This lower floor features the main attraction of Tembo Galleria, which is a 110-meters long sloping spiral, glass-covered skywalk ramp tube that gains height as it circles the tower. 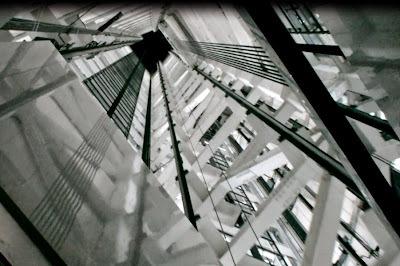 The sloped air-walk ascend is from 445 meters of the lower floor to 450 meters of the upper floor. This spiral tube is constructed of the steel and glass. Such glass-sided tube allows visitors to look down from the giddying height of the tower and also enjoy spectacular views of Kanto region. In fact, glass panels cover even the outer edge portion of the floor of the spiral tube, which makes the visitors feel that they are walking in mid-air. At the top end of the spiral ramp tube is the upper floor of the observatory, which is a conventional observation deck floor with tall windows. The upper floor is located at 450 meters above ground level but there is a slight ascend while walking, and visitors finally reach the highest accessible point called Sorakara Point located at 451.2 meters inside the observation deck. The Tembo Shuttle ride took us to the northern side of the lower floor of Tembo Galleria Observatory. We then entered the sloped spiral ramp tube which circles the tower. 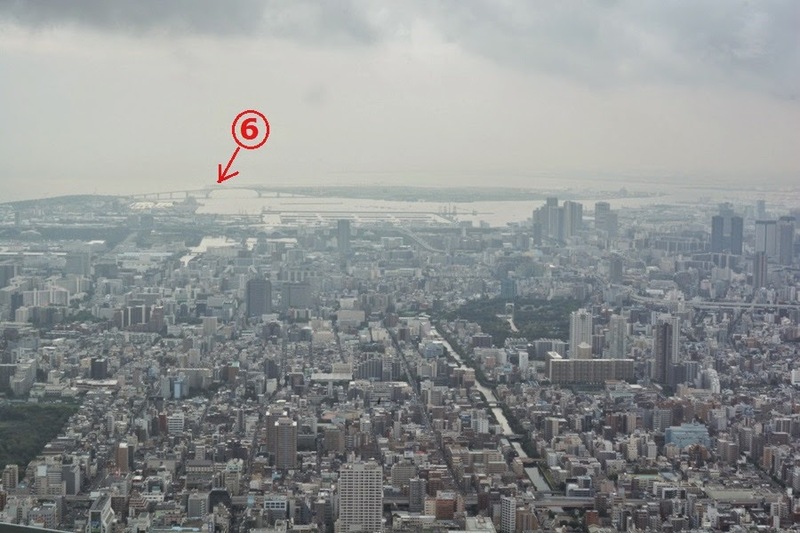 We walked inside the spiral tube and enjoyed the marvelous and breathtaking 360-degree panoramic views of Kanto region, especially Tokyo and its surroundings, from the glass-covered tube. We really felt as if we were walking in the air. It was an amazing experience. We clicked several photos of the panoramic views starting from the north-northwest, and proceeding in an anticlockwise direction. And just like our visit to the lower Tembo Deck, I have again pointed out and numbered several important and historically significant structures as viewed from this observatory also. Number 1 is Tokyo Tower, number 2 is Ryogoku Kokugikan Sumo Stadium, number 3 is Tokyo Dome, number 4 is Asahi Beer Tower, Super Dry Hall, and Asahi Flame, number 5 is Sensoji Temple, number 6 is Tokyo Gate Bridge, and number 7 is Tokyo Disney Resort. 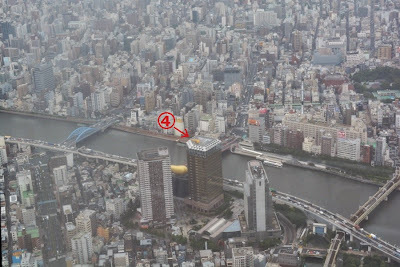 In addition, the exotic shaped Sakura Bridge on Sumida River looked so wonderful. 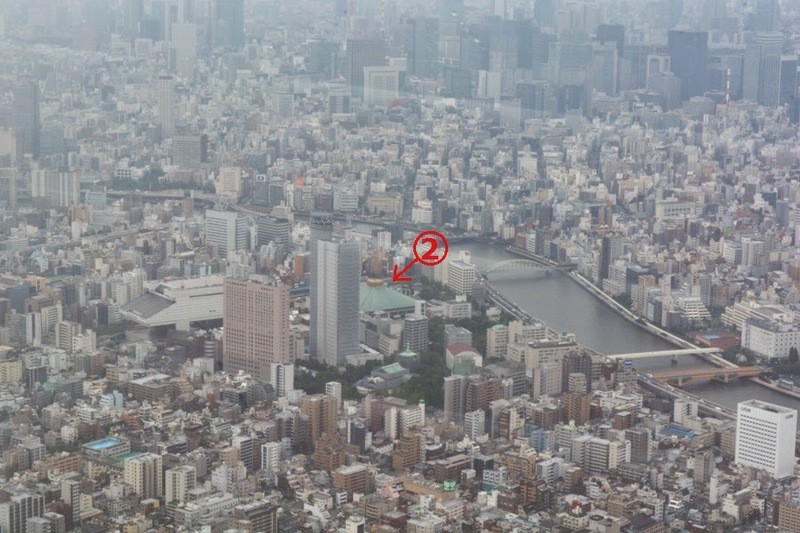 We looked down and clearly saw the roof of the lower Tembo Deck Observatory and all the way down we saw the roof of Tokyo Skytree Railway Station. While walking inside the spiral tube, we steadily ascended from 445 meters of the lower floor to 450 meters of the upper floor of the observatory. On reaching the end of the 110-meters long spiral tube, we looked down and saw the starting point of the tube. The sloped air-walk ascend inside the 110-meters long spiral ramp tube, took us to the end of the tube. At this top end of the spiral tube is the upper floor of Tembo Galleria Observatory located at 450 meters above ground level. This floor is a more conventional observation deck with tall windows. We felt a slight ascend while walking through the deck, and finally reach the highest accessible point called Sorakara Point of the observation deck. 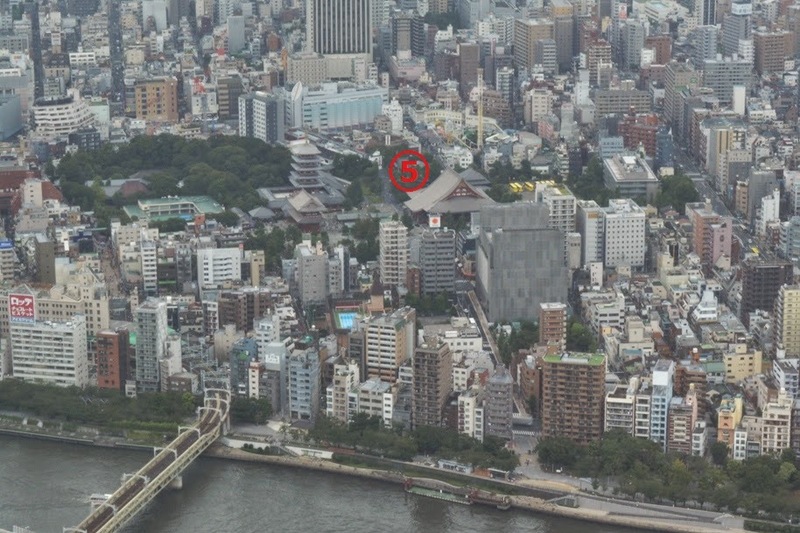 This point is located towards the southwest side at 451.2 meters above ground level, and is marked by Sorakara-chan, the mascot character of the tower. Tembo Shuttle elevators located towards the northern side of the upper floor of Tembo Galleria Observatory took us back down to the middle floor of Tembo Deck Observatory located at 345 meters. Then, we took an escalator down to the lower floor of Tembo Deck located at 340 meters. Finally, Tembo Shuttle elevators located towards the southern side of the lower floor of Tembo Deck took us down to the return lobby located in the fifth floor of the tower. At this point we finished the tour of the two observatories of the tower. We loved visiting Tokyo Skytree Tower. I am very happy to read this post and see all the pictures.